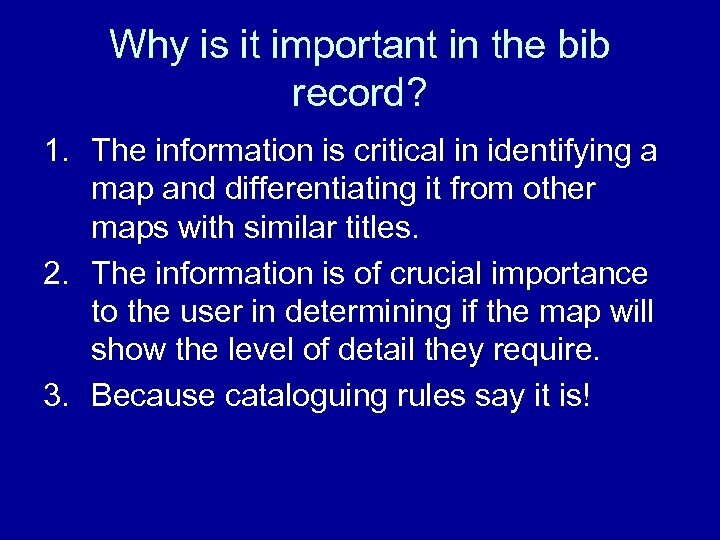 Why is it important in the bib record? 1. 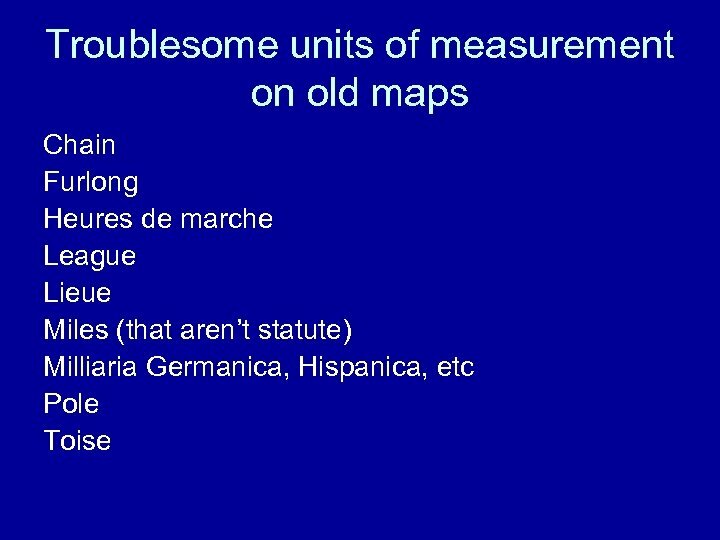 The information is critical in identifying a map and differentiating it from other maps with similar titles. 2. The information is of crucial importance to the user in determining if the map will show the level of detail they require. 3. Because cataloguing rules say it is! 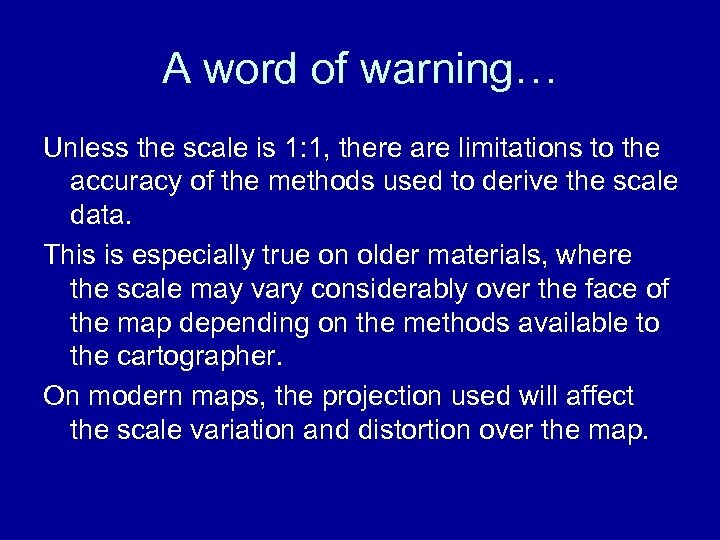 A word of warning… Unless the scale is 1: 1, there are limitations to the accuracy of the methods used to derive the scale data. 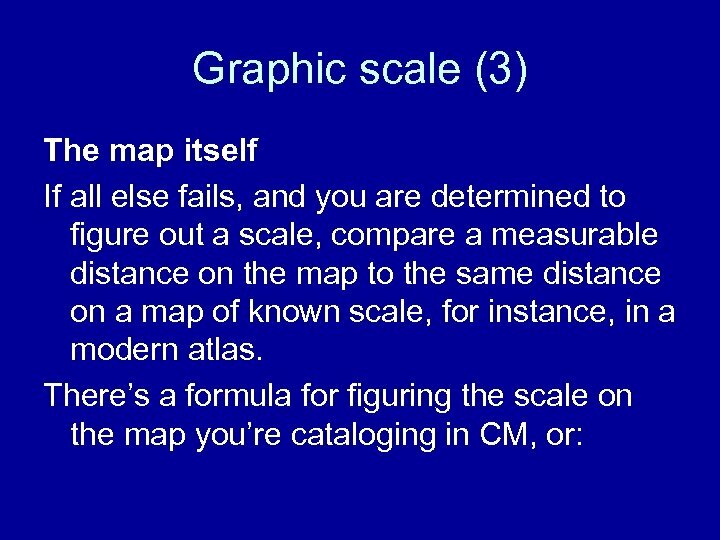 This is especially true on older materials, where the scale may vary considerably over the face of the map depending on the methods available to the cartographer. On modern maps, the projection used will affect the scale variation and distortion over the map. 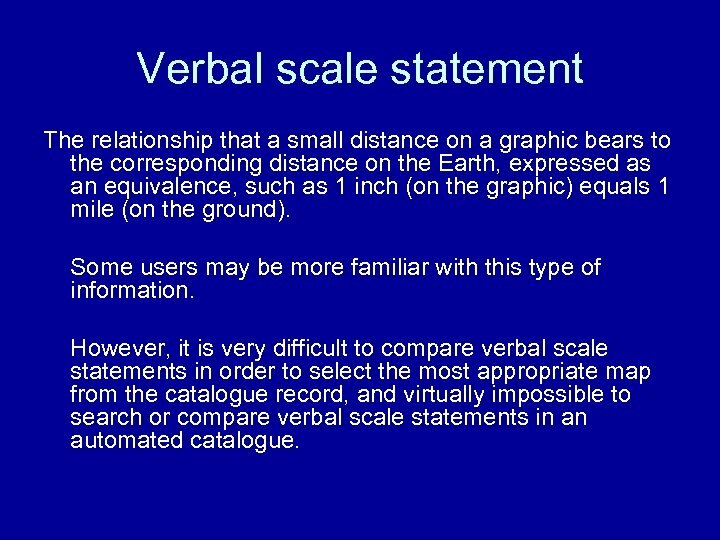 Verbal scale statement The relationship that a small distance on a graphic bears to the corresponding distance on the Earth, expressed as an equivalence, such as 1 inch (on the graphic) equals 1 mile (on the ground). Some users may be more familiar with this type of information. 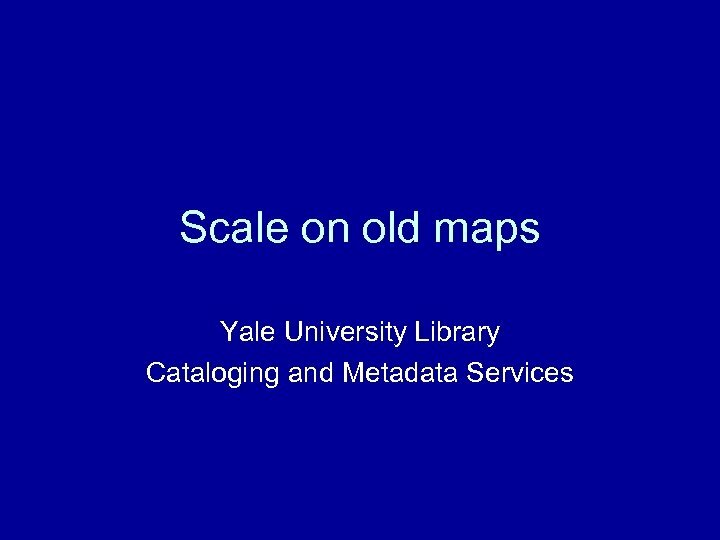 However, it is very difficult to compare verbal scale statements in order to select the most appropriate map from the catalogue record, and virtually impossible to search or compare verbal scale statements in an automated catalogue. 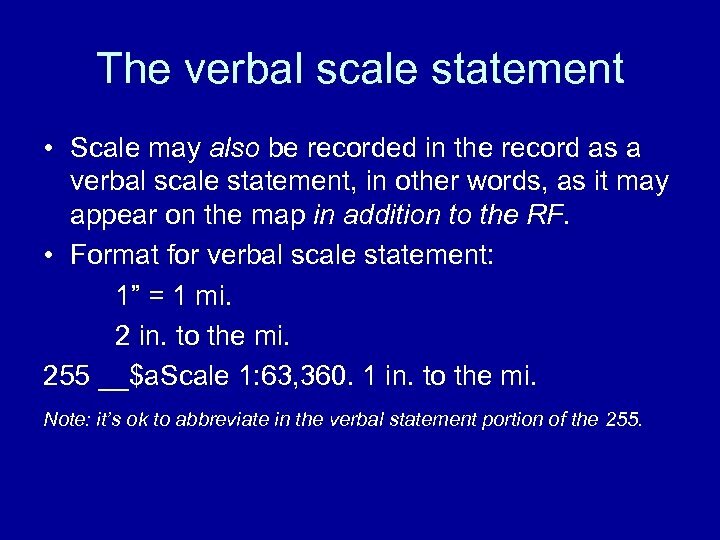 The verbal scale statement • Scale may also be recorded in the record as a verbal scale statement, in other words, as it may appear on the map in addition to the RF. 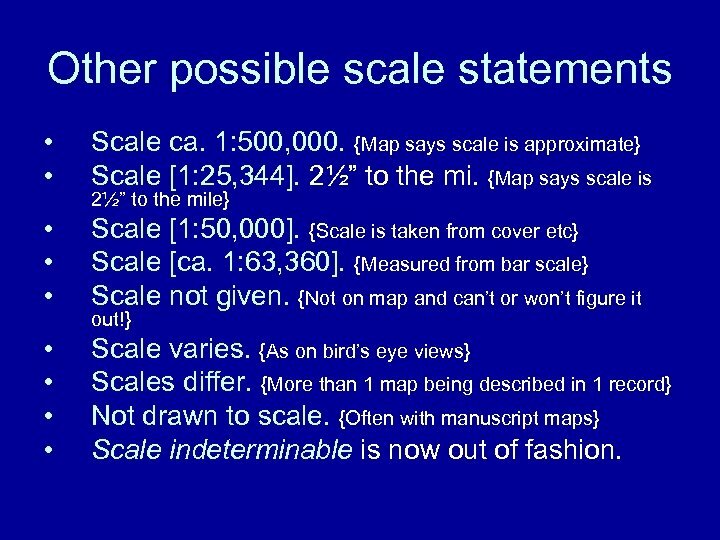 • Format for verbal scale statement: 1” = 1 mi. 2 in. to the mi. 255 __$a. Scale 1: 63, 360. 1 in. to the mi. 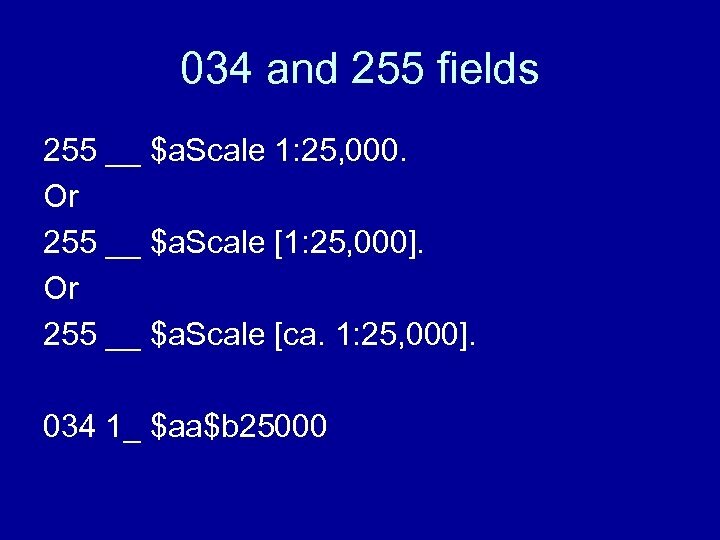 Note: it’s ok to abbreviate in the verbal statement portion of the 255. 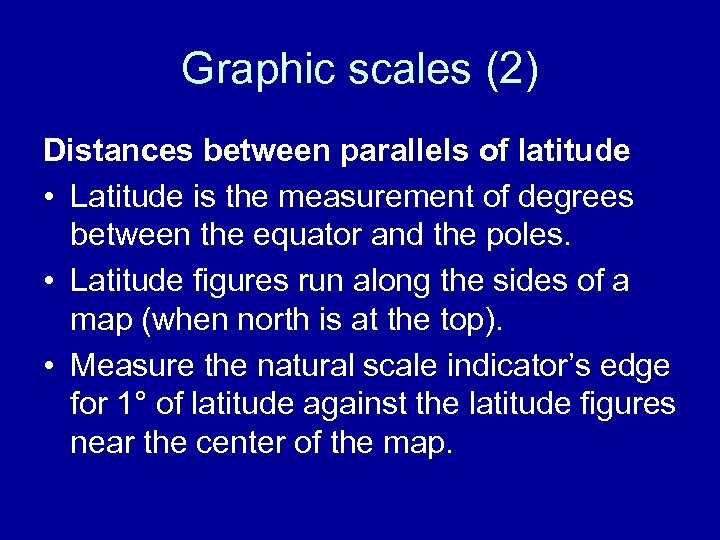 Graphic scales (2) Distances between parallels of latitude • Latitude is the measurement of degrees between the equator and the poles. • Latitude figures run along the sides of a map (when north is at the top). • Measure the natural scale indicator’s edge for 1° of latitude against the latitude figures near the center of the map. 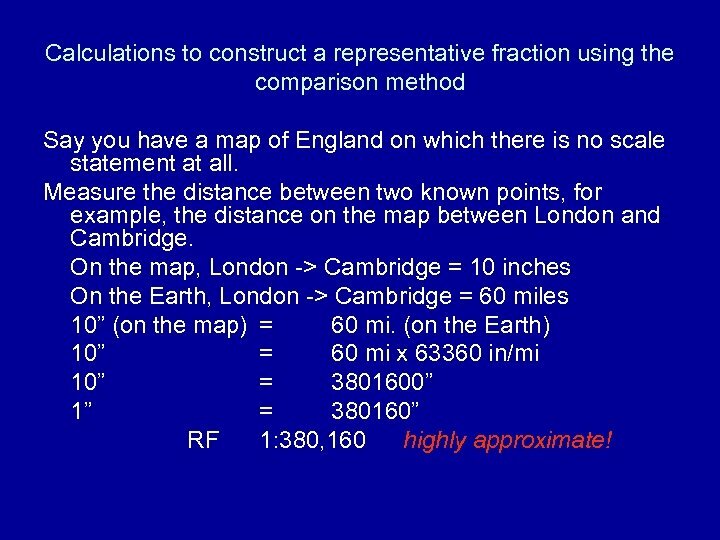 Calculations to construct a representative fraction using the comparison method Say you have a map of England on which there is no scale statement at all. Measure the distance between two known points, for example, the distance on the map between London and Cambridge. On the map, London -> Cambridge = 10 inches On the Earth, London -> Cambridge = 60 miles 10” (on the map) = 60 mi. 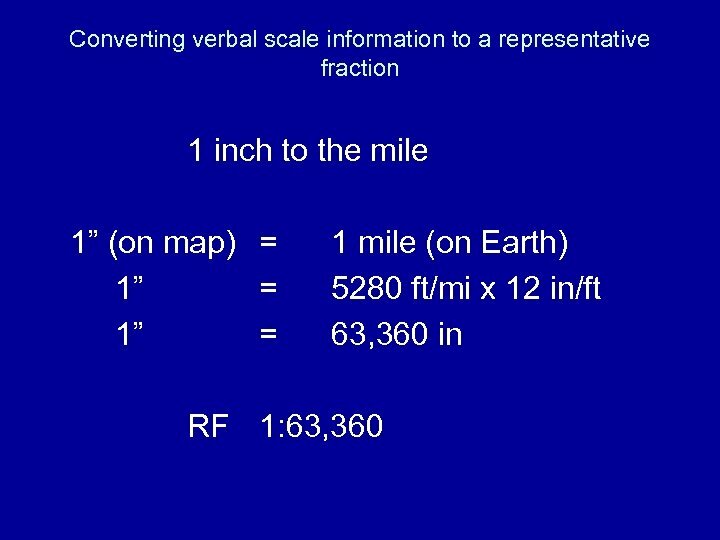 (on the Earth) 10” = 60 mi x 63360 in/mi 10” = 3801600” 1” = 380160” RF 1: 380, 160 highly approximate! 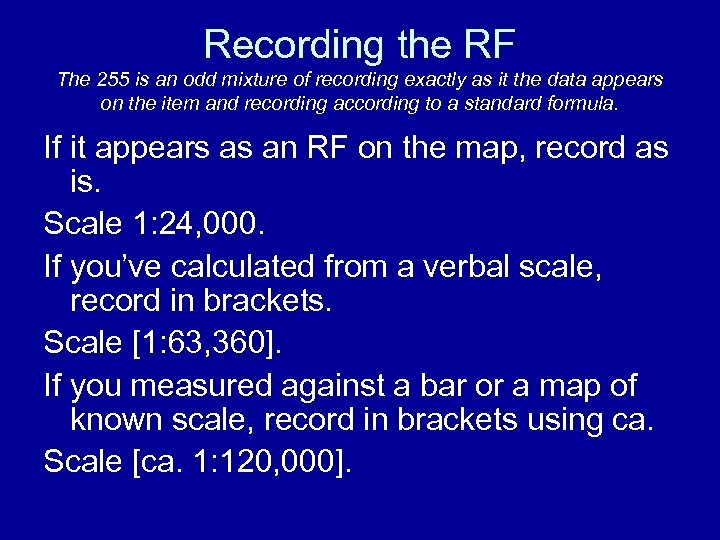 Recording the RF The 255 is an odd mixture of recording exactly as it the data appears on the item and recording according to a standard formula. 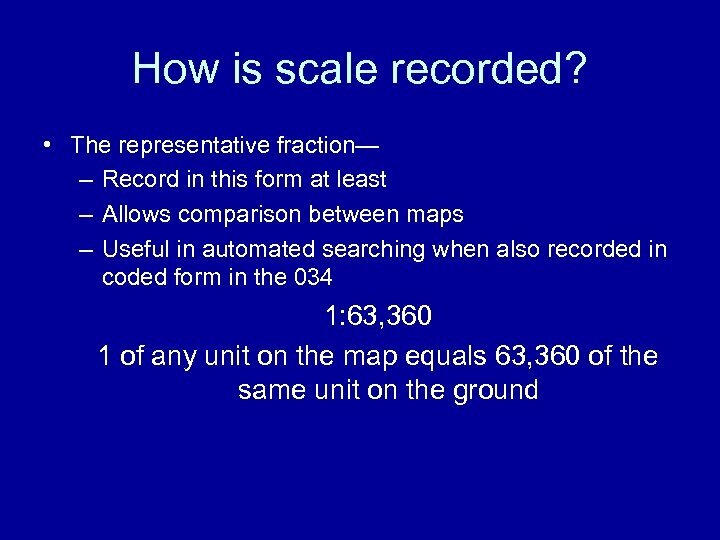 If it appears as an RF on the map, record as is. Scale 1: 24, 000. 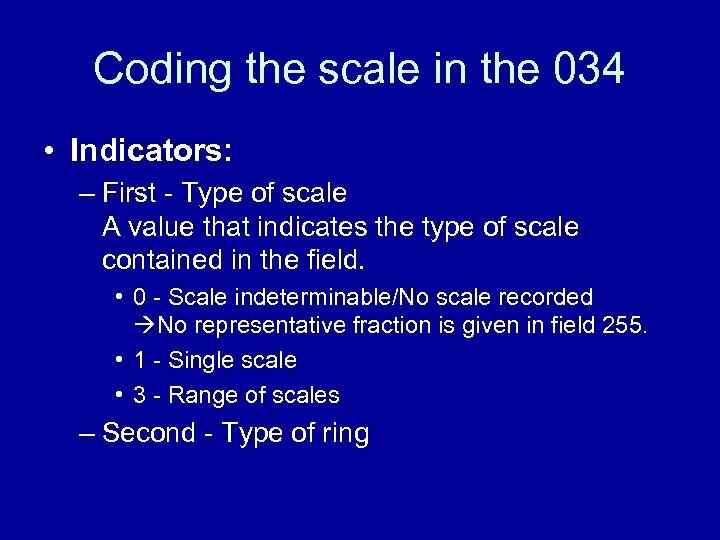 If you’ve calculated from a verbal scale, record in brackets. Scale [1: 63, 360]. 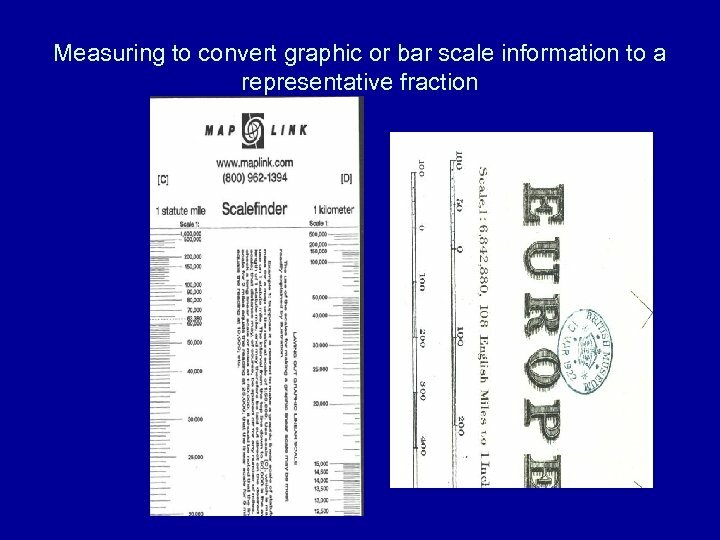 If you measured against a bar or a map of known scale, record in brackets using ca. Scale [ca. 1: 120, 000]. 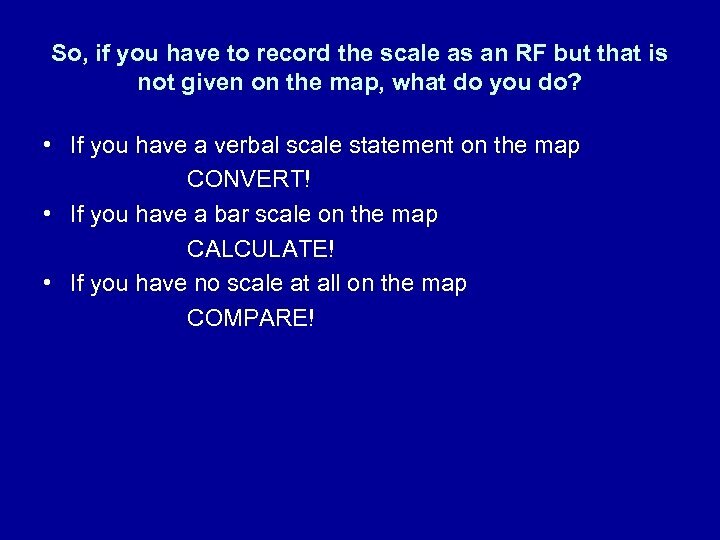 So, if you have to record the scale as an RF but that is not given on the map, what do you do? 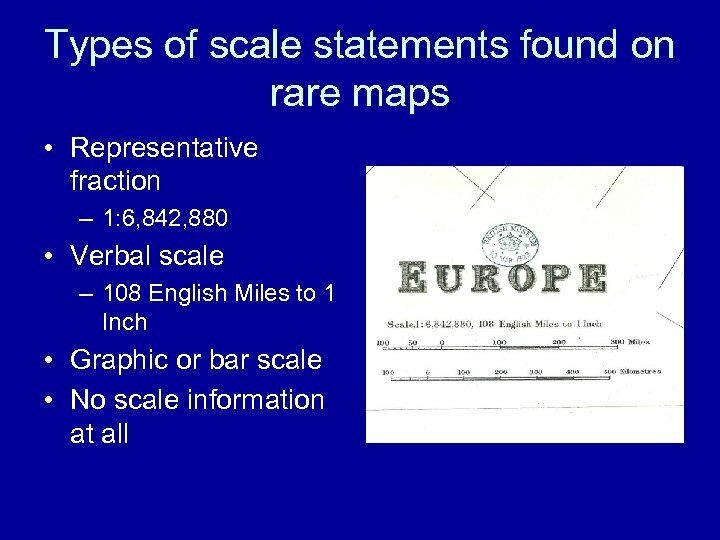 • If you have a verbal scale statement on the map CONVERT! 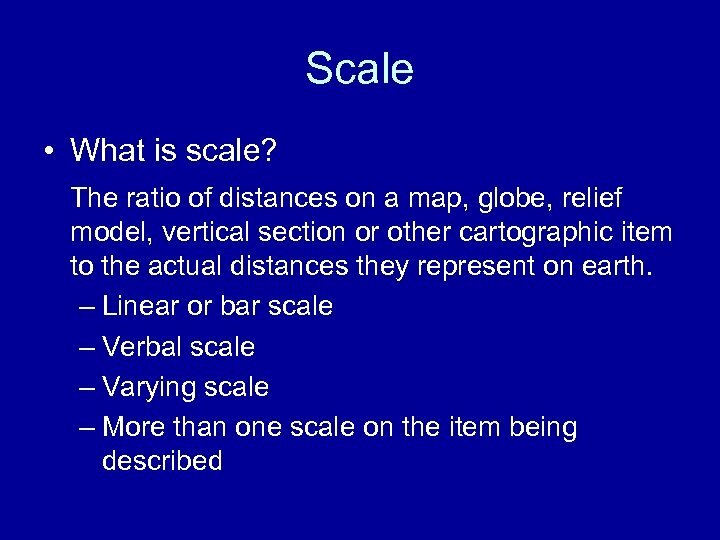 • If you have a bar scale on the map CALCULATE! • If you have no scale at all on the map COMPARE! 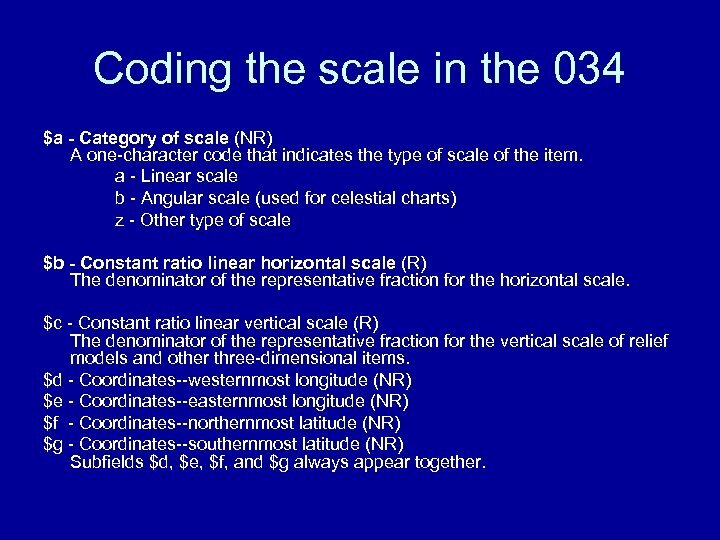 Coding the scale in the 034 $a - Category of scale (NR) A one-character code that indicates the type of scale of the item. 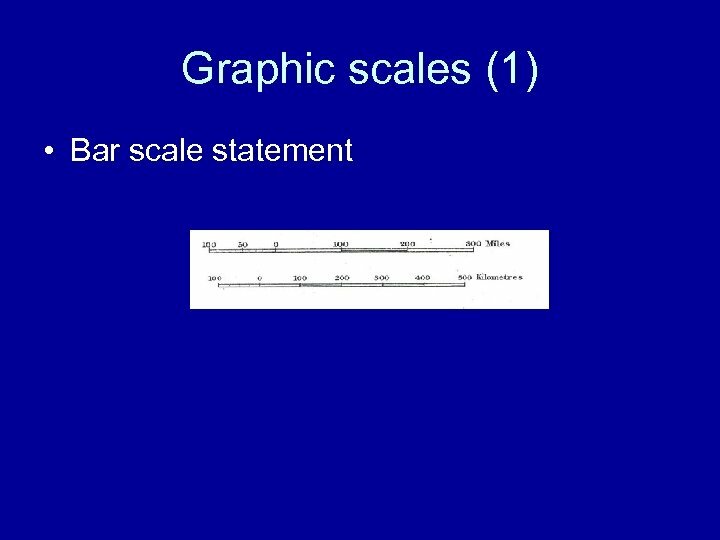 a - Linear scale b - Angular scale (used for celestial charts) z - Other type of scale $b - Constant ratio linear horizontal scale (R) The denominator of the representative fraction for the horizontal scale. $c - Constant ratio linear vertical scale (R) The denominator of the representative fraction for the vertical scale of relief models and other three-dimensional items. 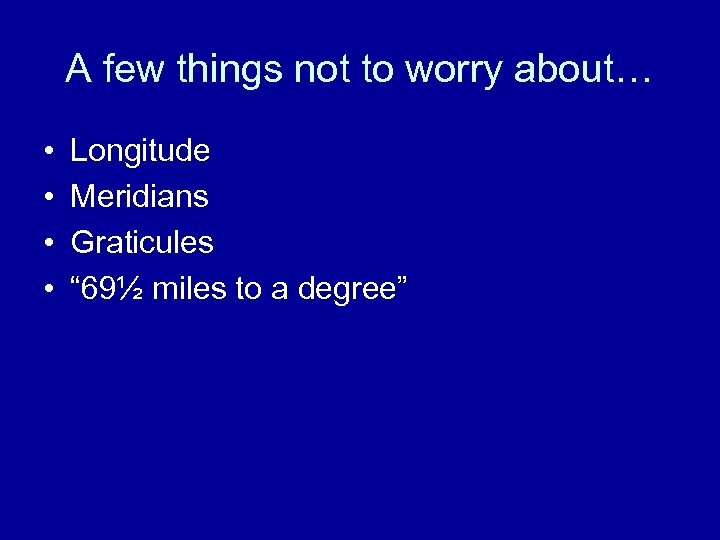 $d - Coordinates--westernmost longitude (NR) $e - Coordinates--easternmost longitude (NR) $f - Coordinates--northernmost latitude (NR) $g - Coordinates--southernmost latitude (NR) Subfields $d, $e, $f, and $g always appear together. Module: Cartography and Geovisualization By: Omirzhan Taukebayev o.